Nowadays, awesome things happen in the mobile, but sometimes, it becomes disastrous. You have noticed that almost every business is having a mobile application to increase brand awareness, boost sales and increase customer loyalty. The restaurant industry is not an exemption. In fact, a recent study shows that many restaurant apps on both Android and iOS devices have failed to attract customers. Approximately, one million app store reviews in the U.S. analyzed by the company and this analysis determined that the average restaurant app earned 38% of a mobile user sentiment. 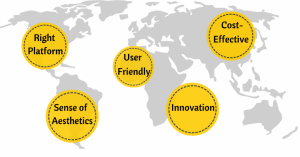 However, do you know a well-designed mobile application only translate higher sales? Mobile applications become popular tools for a restaurant that often use them to introduce a new product, provide deals and simplify rewards programs. The research shows that mobile applications engage consumer behavior for restaurants in a significant way. However, there are some companies that don’t rely on customer engagement, but getting successful in driving consumer spending. If we are looking at the Starbucks‘ transactions, we found that around 21% of Starbucks’ transactions occurred through its application, and 10% of transactions are done through Mobile Order & Pay feature. Additionally, 50% of U.S. sales in Q1 2016 represented by Domino’s cross-device payment feature. Domino’s offers customers multiple payment options across 15 different platforms, including Amazon Echo, Apple Watch, and Samsung TV. Taco Bell’s mobile app also had 20% higher average orders as compared to in-store purchases in 2015. According to the ARC’s report, all these giants, Starbuck’s, Domino’s, and Taco Bell, have scored high. 67.3 was the average mobile sentiment score of an application appeared on the list. Domino’s has around 311,000 reviews and scored an 85.3 whereas Taco Bell and Starbucks scored 55.8 and 63.5 respectively. 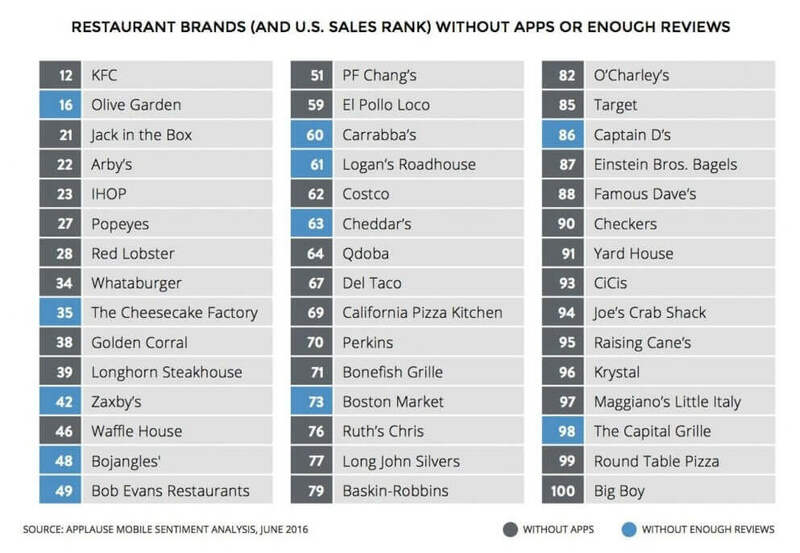 Taco Bell, Domino’s, Starbucks, and Pizza Hut are among the highest-rated restaurant apps and remain trailblazers in the fast food/QSR industry. There are 11 applications that have a chance to improve. However, not all can be winners. 4 out of 10 restaurant chains based on U.S. sales landed in an uncertain company that includes 1 McDonalds, No. 4 Burger King, No. 5 Wendy’s and No. 7 Dunkin’ Donuts. 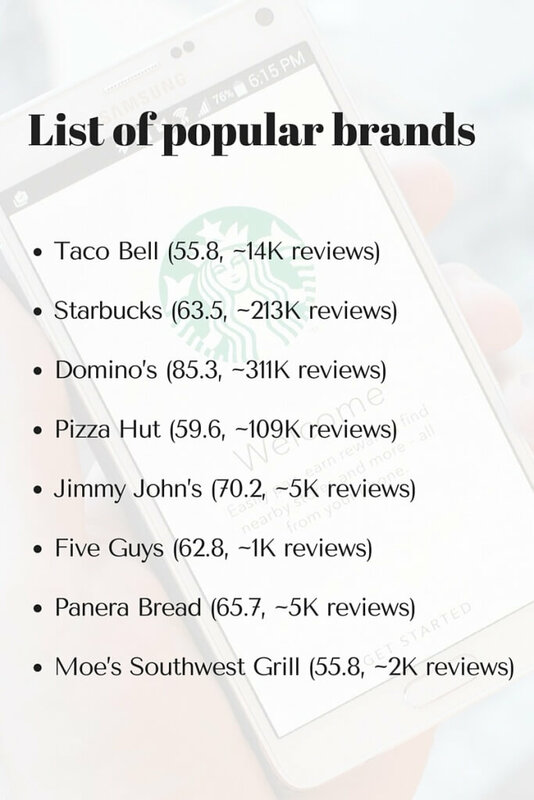 These eleven restaurant chains with apps collected over 1,000 reviews were hit with mobile sentiment scores >33. That means the most successful apps beat into an apparently counterintuitive trend. Foodies will spend more money with a hope to earn free food one day. Do you know 25% of consumers have at least one restaurant-specific mobile app on their smartphone? The best app always loved by the customers and often, delivers what actually consumers are looking for. It is advisable to develop restaurant application that adds value to your customers’ day and offer experience with the restaurant. Don’t develop restaurant app that duplicates your desktop website. Just think of the way and go beyond to help consumers and design to keep mobile first. 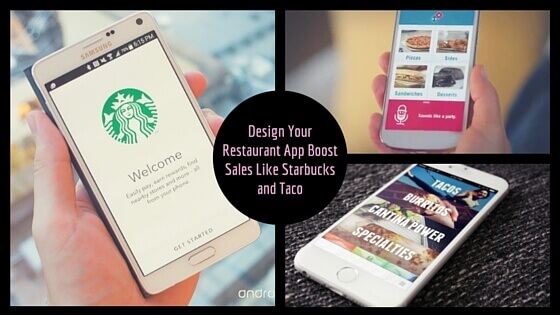 How Taco, Domino’s and Starbucks restaurant mobile apps became successful? Because, they have added mobile order-ahead, loyalty programs, and favorite order features that increase the app engagement. Those restaurant companies that don’t have such features received negative reviews from the research group. It also shows that customers are aware of such features and restaurant applications that have these features. Successful restaurant app like Taco, Domino’s and Starbucks have decided the impact of having a mobile application for other restaurants. 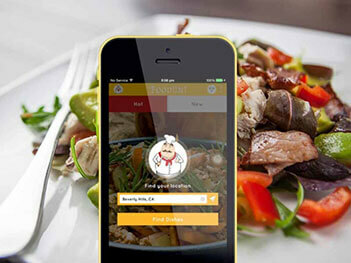 There is must have features for restaurant apps to compete with the fast-paced mobile environment. Research says that 20% of total transactions are coming through mobile applications. Moreover, there are other features that also help to improve the business and drive clear value for the foodies. Mobile Loyalty Program – Acquiring a new customer is 5x costlier than the cost of keeping existing. Thus, one of the core features that a restaurant application should have is a loyalty program have in their mobile app. Customers are still using punch cards and plastic loyalty cards, but, many times, customers can lose them or forget to use it in a crowded line. Including Mobile loyalty allows customers to login through an application and store all the information. The loyalty program can be connected to the transaction data for measuring success. Social Media Integration – Social media plays an important to engage users with brands. Integrating social rewards into an app enables you to reward customers with loyalty points, offers, competition entries, and many more. The restaurant can use this information to create reward campaigns that match the marketing requirements and offer engagement to the foodies. Social rewards also drive new revenue through word of mouth marketing. Online and In-app ordering – In-app ordering and online purchase enhance the efficiency and accuracy of the purchase cycle. If you are allowing your customer to order through a mobile app, they will choose your restaurant over competitors. Big restaurant companies like Starbucks has set the standards for mobile applications that result in larger purchases, improvements in order accuracy, reduce queue times, faster service, and increased efficiency. Mobile Payments – Annually, 40% of a transaction has been increased by mobile payment volume, according to Juniper Research. So, integrating mobile payment options into restaurant app increases a lot of potential revenue. Mobile payment offers valuable customer data and also, boost the adoption of the loyalty program, increase average spend of customer base and accelerate checkout times in-store. Only in the US, Starbucks app accounted for 21 percent of all sales through mobile payment. Beacons and Geofencing – Using location-based technologies such as beacons and geofencing offer customer engagement to the brands before they visiting the store. Beacons and geofencing is an alternative of highlight a new offer, promote an item and deliver relevant news to the customer. Uber, a ride sharing company, introduces its food delivery service to the UK. Uber for food delivery, UberEATS is launching in central London for users to deliver food from nearby restaurants, including Chilango, Pho, Comptoir Libanais, The Good Life Eatery, Hotbox, and the frozen yoghurt cafe Snog, within 30 minutes through dedicated application and website. Initially, Uber chooses 150 restaurants in central London for delivery through scooter and bicycle messengers between 11am and 11pm. 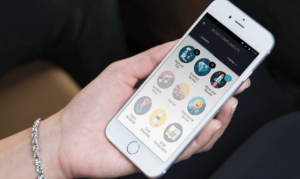 On demand Food delivery application for Uber shows an average of approximately 20 participating restaurants in the immediate area with their menus and meals’ picture. The delivery fee is decided between £2 and £2.50 after an initial month-long free period with no minimum price. Developing food delivery app like Uber along with restaurant application boost customer engagement and ultimately, increase sales. There are many mobile app development companies, including Space-O offers restaurant app development service for different platforms. Our mobile app designer and development team is also developing an app like Zomato, considering the quality standards and latest trends. Maybe you’re in a Dip – a temporary setback that will get better if you keep pushing. But maybe it’s really a Cul-de-Sac, which will never get better, no matter how hard you try. Partners like Space-O Technologies can help food and dining brands to dig dip into the data behind their promotions in order to make them more strategic and impactful. This page was last edited on June 1st, 2018, at 6:49. Our team is here to answer any questions you may have about building an Restaurant App!